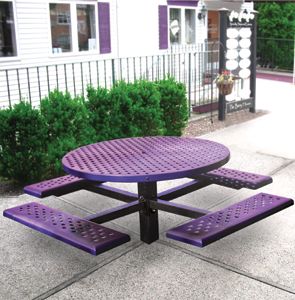 Make your restaurant the favorite destination all year round by placing these perforated round tables in your outdoor eating area. Dining patios are a great way to attract more customers, and providing comfortable and attractive seating is the way to keep them coming back. The single pedestal design makes maintaining the eating area simple, and the tables can be ordered with four, three or two seats to best fit your surroundings. 2-1/2" x 1/8" Square Arms. Available with 4, 3 or 2 Seats. 13 Ga. Perforated Steel Top/Seats. 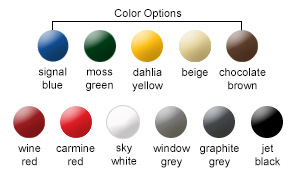 The state of the art finishing process used on the table top and seats combines the application of an 'Electrocoat Zinc Rich Primer' with a durable polyester powder-coat top layer to ensure every crevice and joint is completely sealed, providing full protection against	corrosion and weathering. Table tops and seats are finished in either a gloss or textured polyester powder-coat finish.